Active senior couple running in the woods. You probably know that regular exercise offers a wealth of benefits for your body, like staving off excess weight and chronic illnesses like heart disease and diabetes. But mounting evidence suggests that exercise is also good for your brain. 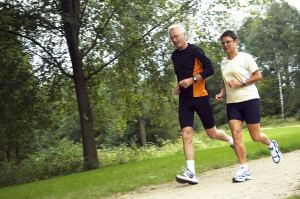 A study published in the journal Neurology links better cardiovascular fitness to improved thinking skills in older adults. The findings add to our understanding of how exercise benefits the brain, which seems to stem from several possible mechanisms, says Dr. John Ratey, associate clinical professor of psychiatry at Harvard Medical School and author of Spark: The Revolutionary New Science of Exercise and the Brain. “It’s not just about delivering more oxygen to the brain, although that’s part of it,” he says. Having a fit, healthy cardiovascular system also protects against vascular dementia, which happens when blood vessels feeding the brain become blocked or narrowed, leading to memory and other cognitive problems. But exercise also stimulates the growth of new blood vessels in the brain, as well as the growth and survival of new brain cells, says Dr. Ratey. Brain imaging studies suggest that key brain areas responsible for thinking and memory are larger in people who exercise than in those who don’t. The new study included 877 adults with an average age of 65. To assess their cardiovascular fitness, researchers used a standard measure known as VO2 max, which is defined as the maximum amount of oxygen your body can use while you’re exercising as hard as you can. (The V stands for volume, usually measured in milliliters of oxygen per kilogram of body weight per minute. O2 is for oxygen, and max is for maximum.) The participants also took a variety of tests to gauge their thinking skills, memory, and executive function (a category of mental skills used to manage time, plan and organize, and remember details). When researchers divided the participants into four groups based on their VO2 max values, they found striking differences in executive function between those with the highest and lowest levels. In fact, the test score differences corresponded to an age difference of seven years, they estimated. They saw similar trends for both memory and overall thinking ability, corresponding to age differences of six and four years, respectively. In a study published last year in Neuroimage, participants underwent functional MRI testing, which tracks the changes that take place when a region of the brain responds during various tasks. The researchers found stronger connections between different regions of the brain in people with higher levels of cardiorespiratory fitness. Earlier research also correlated fitness levels with activation in the brain’s frontal lobe — the part of the brain responsible for executive function. Two hours and 30 minutes of moderate-intensity aerobic activity, like brisk walking OR one hour and 15 minutes of vigorous-intensity activity, like jogging. Muscle-strengthening activities on two or more days per week.